Save hours by automating repetitive data entry and communications tasks. Workflows are automated sequences of actions that replace manual tasks, data entry, or constituent emails. Our team has taken the if/then logic and automation functionality common in for-profit sales and marketing software, but made it more affordable and tailored to nonprofits like yours. Leverage automation to get more done and save time for what matters most. 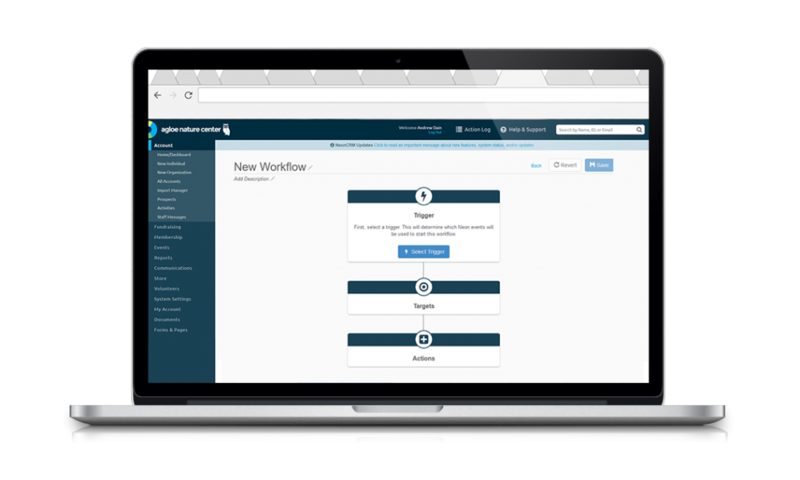 Build a workflow to automate data entry and manual tasks that used to take hours. Put your CRM’s data to work to create targeted messaging and personalization. Create if/then branching logic with up to 15 steps or actions for in-depth engagement. Automation should be affordable for nonprofits — not just a tool for sales and marketing software. We created workflows to work with your nonprofit’s budget. All NeonCRM clients can create 1 active workflow, included with your monthly subscription. Additional active workflows can be added for a fee, based on your organization’s needs and size. The monthly fee for workflows is an add-on to the cost of your NeonCRM package. For more information, visit our pricing page or get in touch with a Nonprofit Sales Consultant.